What Black Star Books and Caffe offers doesn’t fit on a menu. Sure, there’s coffee and food, but you’ll also find art, music, books, life lessons, and even a business incubator. Owner Baakir Tyehimba created this space for people to enrich their lives through education, entrepreneurship, and community. We sat down with him to find out why he infused his coffee shop with so much culture. My wife and I started an African-centered homeschool to offer a quality education to students without burdening parents with tuition costs. To sustain ourselves while we did this, we decided to open up a business. We chose a coffee shop because it’s the type of space that brings communities together and creates an atmosphere where good thought and conversation flow. What inspired the name “Black Star Books”? I’m Islamic, and in their teachings, the star represents the child. The sun is the father, the moon is the mother, and because stars are the most plentiful thing in the galaxy, they are the children. Everyone is a child of somebody. I’m also a big fan of Marcus Mosiah Garvey who was instrumental in raising up pride in the black community. He had a passenger ship line called “Black Star” that took people to and from Africa around the time of the diaspora. The familyhood of it. The local businesses ask, “How ya’ mom’n’em?” Momma is the manager and nurturer of the house. So when you ask about someone’s Mom, you’re really asking how the whole family is doing. When you get to know different business owners in New Orleans, that’s the type of questions and care that come about. Everybody. I think it’s because of where I’m situated. There’s a lot of tourists that come by way of the ferry—I’ve gotten foreigners from Germany, Australia, the UK. I’m also in the middle of a predominantly black neighborhood. And as much as black folk drink coffee, we tend not to drink it in coffee shops. So we’ve been working on drawing in the local neighbors. When you come through the door, we say, “Welcome black home!” Here you’re a brother, sister, uncle, aunt, cousin. If your shop was a beverage, what kind would it be? The “Marcus Garvey.” It’s a combination of two house teas—the “Yemmalade,” a lemonade infused with rosemary herbs, and a sweet “Brown Sugar Baby” tea. The tart mixed with the sweetness… mmh it’s delicious! My friend LaMonte created it and it’s not on the menu, but I know when he sends someone in because that’s what they ask for. Oh, few words! But I talk a lot! 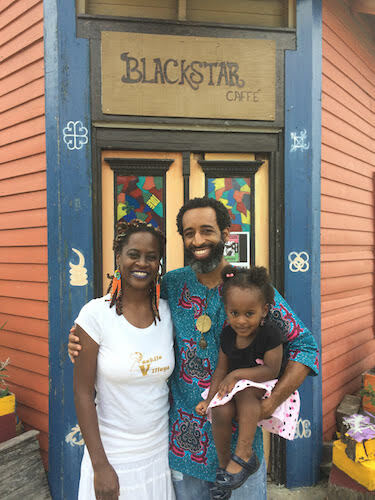 I would say that Black Star is a community hub and small business incubator for the benefit of the community. The space was once a house so we allow people who have different ideas to come in and do their idea without having the strain of heavy overhead. We even kicked off two restaurants here. Each started doing brunch here and they got so popular they had to find larger spaces. How would you define success in your business? A lot of happy and smiling faces. The one compliment that means the most to me is when people say, “I felt I was at home.” I get that a lot. Success for me is really to have the capacity to serve the community and the people who come here. We have to expand! I want to do a serious renovation of the building to make it flow better. We have a gift shop that we need to figure out how to pull in all the right products. We have a community library and want to put in more things for the children. In the backyard, we want to develop an open-air food court. Like I was talking about the business incubators– imagine having a small kiosk with a juice bar or live greens, the opportunity to establish yourself. I have two. Copper Bamboo—it’s a clothing store and natural hair care spot that sells a lot of clothing to my wife. Then there’s Community Book Center; I get my daughters things from there. Nearby there is a place called The Kitchen on General Meyer Avenue. It’s like eating in the French Quarter but not having to be in the French Quarter. I also like Bennachin’s. It’s in the French Quarter on Royal. It’s West African cuisine. Be diligent, patient, and humble. Stay true to your vision because that’s why integrity exists. There’ll be a lot of advice and suggestions about what you can do to make more money. Even though people say business is to make money, a lot of times people don’t understand that that’s not your motivation. And so, integrity stays when you stick to your vision. Open Noon to 7 p.m. Tues – Sun.